Was awesome for a back yard pizza party. I made roughly 7kg of dough following the recipe from the book, Flour, Water, Salt, Yeast by Ken Forkish- excellent book if you are into bread and pizza making. Also followed his recipe for San Marzano red sauce (get the certified tomatoes people, its worth it!). All the guest brought toppings and we got to work. In total we cooked up over 30 pizza’s – all with fun and creative topping choices from the guests. Big Hit! Highly recommend getting the baking steal- it helped cook the tops of the pizza. 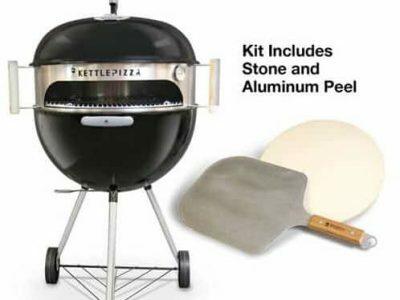 Also get a high temp stone, preferred pizza pans and some pizza spinners. Let the stone get nice and hot. I ended up using a lot more wood then I thought I would need to keep the temp well over 500 degrees. I started with roughly 5 lbs of seasoned oak, bucked up into small chunks, but ended up needed almost 3x that amount for 2 hours of grilling. The kids got this for me for my birthday, and am I glad they did. I have cooked pizza on my Weber before,but I was always a little disappointed with the results. I have had this device for two weeks, and we have used it every Friday night since we got it. I was a little worried that I would not get the advertised temps, but it was no problem. I use one full Weber chimney starter of ordinary Kingsford Briquets, (my preferred, their cheap)arranged in a semi-circle around the back of the grill, then I add about 6-8 fist size chunks of either applewood or hickory. It takes about 10 minutes for the temp to max out both of the thermometers. I have a 14″ pizza stone that I got from a local big box store, (again, it was cheap and it works), and I put that in the oven to warm up with the grill. We make the dough from scratch using Fleischmans Pizza Crust yeast. You don’t have to wait for the dough to rise, and it makes a bomb crust. We roll the dough out on a wood pizza peel, using plenty of corn meal to keep it from sticking. Then each of the kids will add what they want for toppings and it goes in the oven. Total prep time for the pizzas is about 15 minutes, and once it goes it the oven it take about 4-6 minutes to cook. Golden brown crust, hot melted toppings, YUMMM! 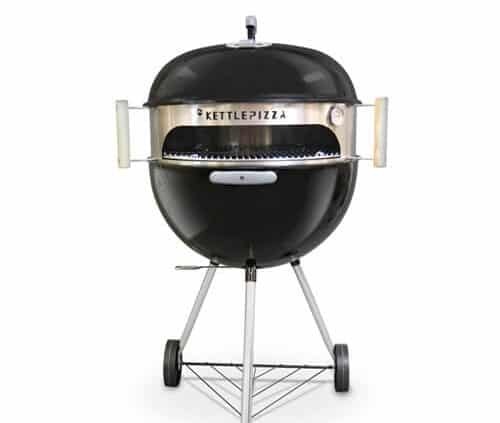 The grill stays hot enough to cook about 3-4 pizzas before adding more fuel. I never have added more charcoal, we just add more chunks of wood when the temps drop below 700, and the temp comes right back up. The first time we used it we cooked 7 pizzas, which around here was just about enough. There was a note in the box that said if you posted a video of the oven in use on youtube, they would send you a free gift. I posted the video, sent them the link, and within a week I received a very nice BBQ apron and some other gifts along with a nice personal note. You can’t go wrong with customer service follow through like that. American Made, does what it says it will do, great customer follow through. A simple top plate of steel (even just 1 or 2 mm thick) would make all the difference to temperature and cooking time, and before you ask if I used enough charcoal etc, yes! of course I did, it’s just simple physics, that’s all. It was really the “wife-acceptance-factor” (WAF) that sold it- prettiness. Sometimes the simple solutions are the best. Couldn’t be happier – it arrived quick, was easy to assemble, and works perfectly! Purchased this for my husband as a gift after learning about it from a friend. He loves making pizza from scratch, but has not been able to get grilled pizza to work until now. Product was delivered quickly; extra bonus to purchase during promotion with free shipping and grill gloves. Instructions are very well written. But not sure all the product add-ons are necessary. For example, we are currently using alternate-brand pizza stone without any performance issues. But definitely would recommend the base product if you want to do great pizza on the grill! 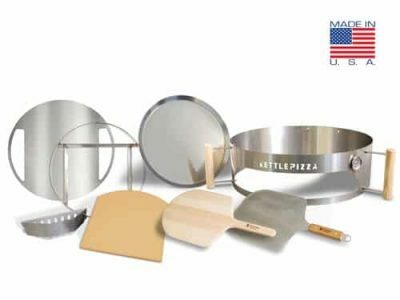 I recently purchased the pizza stone and stone holder kit to add to my existing Kettle Pizza equipment.. Then we had a family party and made multiple pizzas and calzones. It was a lot of fun and we made six very different pizzas and calzones. All had fun custom-making their own pizzas and cooking them in the Kettle Pizza oven was so was easy. 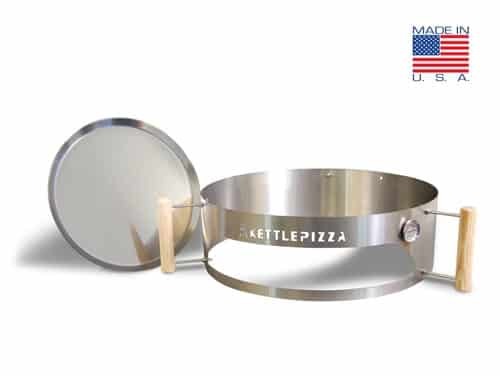 I know one person went and purchased their own Kettle Pizza kit after seeing how easy it was to make pizza on the barbecue. Thank you for your good quick service, which I liked it very much. Excellent job! Will repeat the order when I need something more. Great product providing excellent results the first time I used it. Very impressed with the simple design augmenting the Weber kettle grill. A real value when you compare to other methods of grilling pizza such as a Green Egg or Kamoda grill. It was shipped promptly and it arrived in good shape just in time for Christmas. We haven’t used it yet because there’s a piece missing to attach the thermometer. So, My husband sent a question/message through their Facebook page but we haven’t gotten an answer yet. We’ll try to email customer service directly. I’ll review this product again after we use it. The pizza oven was very simple to assemble and our first attempt produced wonderful pizzas. Fits perfectly with a Weber premium 22′ grill which allows adding more wood/coals to keep the temperature up. We used hickory wood chunks and will try different types of wood for different flavors. This worked as advertised, so well that I am upgrading to the stone/peel add-on. The only issue will be feeding the fire with out having to remove grate. I think the ProGrate/Tombstone combo will relieve my stress. It looks like it was described and we can’t wait to use it. Shipping was fast. Kettle was easy to put together, Our first pizza night was a great success. Love the high temps that are possible with the kettlepizza! If you love making pizza, you have to have one. By far the greatest accessory for my Webber grill!!! I’m sent to Italy every time I eat a pie from the kettle pizza!!!!!! I received the kit in a couple of days , used it a couple days later . I used oak lump charcoal and hickory to provide the heat , it was well over 700 deg . The pizzas were amazing , now I’m thinking skillet brownies with residual heat . Awesome product . we finally had a chance to use our new pizza oven and we loved it. Great advice in the booklet, pizza was very tasty and it is well made. We will be recommending it to all our charcoal grill friends! the kettle pizza kit performed flawlessly, I am very pleased with my purchase. I used my KettlePizza and it worked great! The pizza crust was crispy and the cheese was melted and browned nicely. All I need now is a metal peel and pizza spinners! Well made. Easy to assemble. Videos are extremely helpful on proper baking technique. Only problem is that we are experiencing 95 degree heat and 85% humidity here so baking may have to put off for a few months. But cannot wait as we have great pizza flour and fresh yeast ready to go! Received shipping information immediately after purchasing, item arrived very quickly and works wonderfully! Couldn’t be happier! Gave this to my husband for Father’s Day. We had naan dough ready to bake. Even though the outside temperature was 95+ degrees, it was a huge success! Can’t wait for the weather to cool off a bit before we try it again. Love the product. Tried it out the day it was delivered. I know we will have fun & enjoy making the pizza’s. 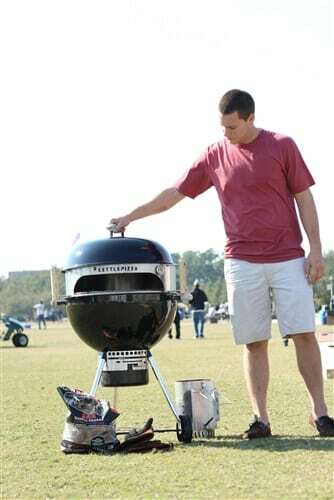 We love to grill a lot & tailgate during football season, so this will get a lot of use! First mention is the quality of the KP product, it is a very high grade steel, not some flimsy cheep metal. I’ve always said I’ll be glad to pay more for a product that is high quality and made with care. I love that it is made in the USA. And of course the innovation of the product. Of course I would love to have a custom brick oven made for my outdoor patio, but when I saw this made for the Weber Grill, I thought what a perfect solution. Please keep up the quality, don’t cheapen the material in order to increase margins, people will pay more for a quality product. I gladly will recommend the KP to friends and family. And finally I don’t have to heat up the oven to make pizza in this Arizona heat!! Pizzas come out perfect by the way, I would never be able to get the same crust in an oven. I have only begun using the Kettle Pizza, so I have a lot of work before I master it. However, setup is as easy as pie, and the first pizzas came out delicious. We love the kettle pizza ! It was very easy to put together and we can’t wait to have a party and show it off to our friends. Hopefully they will like it as much as we do and get one for themselves. If you’ve always wanted to have a wood fired pizza oven here’s your chance! Works awesome. Shipped FAST, easy to assemble, great quality, performed well, helps keep the temp up (700/800), just need to work on the timing now! Great quality build. Easy to set up. Learning how to build the right fire. Having a lot of fun. 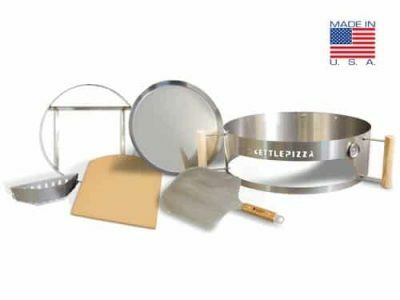 The Kettle Pizza Basic Kit is easy to assemble and use. The pizza that we cooked came out amazing and cooked extremely quickly. My husband was very happy with this as a gift. I highly recommend this product to anyone who is a pizza lover. What a great product. Ordered on a Sunday and received on Wednesday. It was easy to put together and the directions for assembly were clear. The pizza was outstanding. By the first night, I had made 3 pizzas for several kids and they proclaimed it, “The Best Pizza Ever!” We can’t wait to try more pizza creations. I’ve tinkered for years with all kinds of different pizza-making gadgetry, in a never-ending quest to make authentic wood-fired pizza. The Kettle Pizza wins. It makes fantastic, authentic wood-fired pizza, while leaving plenty of room for the kind of further tinkering that people like me need to engage in to add meaning to our lives. Wonderful product, performed as advertised! My family and I will be making more homemade pizzas in the future!! Thanks for the fast delivery! Highly recommend for a great family/friends get together! The Kettle Pizza is an awesome system. We baked our first wood fired pizza and it came out fantastic. I used the stock pan to make the pizza. Pizza came out beautifully. I used a Weber Chimney Started, with 1/2 briquettes, 1/2 lump charcoal, 1/8 of a log of hardwood. Started my coals and made a “C” Shape after they were hot, as instructed. Added my log of hardwood, put on the Pizza Kettle and off we went. Temp reached the 700+ degree mark, put in my pizza on the pan, turned after about 2 minutes (keep an eye on it as it goes fast). It is easy to check looking in the opening. Pizza came out great. I will invest in the pizza stone for an even crisper crust, however, this worked very well. Just follow the instructions that came with it. It is simple. Temperature control is straight forward using the Weber vents. Like any outdoor cooking you must keep a watchful eye. Thats all part of the fun!